Steven (Chicagoland, United States) on 30 October 2013 in Architecture and Portfolio. 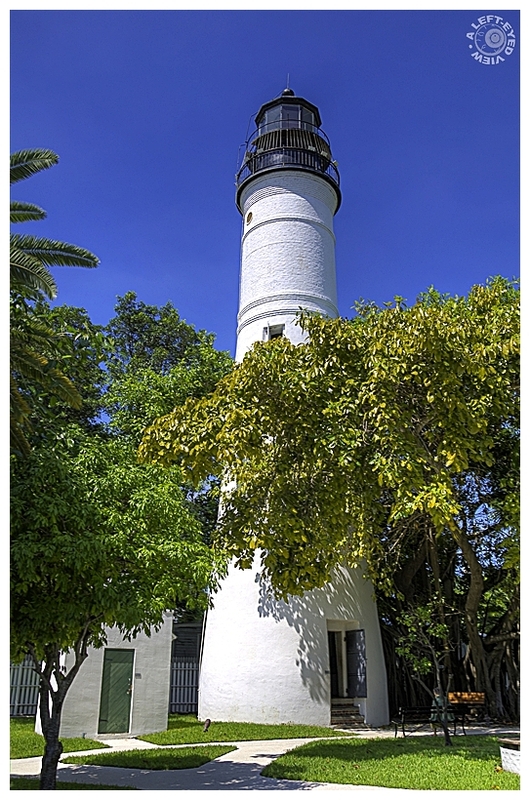 The Key West lighthouse was built in 1847 to replace the original wooden tower on Whitehead Point destroyed the previous year by a hurricane. The present location, 14 feet above sea level, was chosen to protect the new tower from a similar fate. This tower was 66 feet high with a fixed white light. In 1894, twenty feet were added to bring it to its present height. The three red sector panels were the code signifying dangerous approaches to the harbor. The lighthouse was decommissioned by the U.S. Coast Guard in 1969. The tower was restored for $265,000 in 1989, re-opening in February. Its 175-watt metal halide light which works on a photo-electric cell lights up as the daylight diminishes can be seen several miles out to sea. very lumineux !! !beautiful photo !!! NIce picture, and yet it gives me the feeling that it is probably 400 yards from the coast. Probably all of that greenery instead of sand and rocks! A marvellous perspective and beautiful colour combinations you have captured here ! A beautiful capture ! Great framing - that light house looks great against that beautiful blue sky. Beautiful shot, Steven, from top to bottom, set against that gorgeous blue sky! Excellent shot. I like the sunlight on this structure and the bit of leafy shadow down near the base. @Phil Morris: Believe it or not, but that's a life-sized statue on the bench. They had many figurines perched on benches, dancing, and flying kites around the grounds. I've been trying to figure out how to post them while also making them interesting shots. A wonderful image of this beautiful lighthouse. Even given the harsh locations of these structures, I think they'll be standing long after less well constructed buildings are long gone. so beautiful frame, colors, lights & shadows! Gorgeous image! This is just beautiful! I am glad that the lighthouse was restored. It would have been a real shame to have lost it. The colors are wonderful, and the composition is excellent and strong with the white light house elevating above the trees. Great framing. Lovely bright white against that perfect blue sky. A beautiful lighthouse with a sober design, wonderfully highlighted against the blue sky ... Fabulous shot, the colors and light are gorgeous !!! Wonderful capture; the trees surrounding the lighthouse are an added bonus! I love Lighthouses and this is a beaut. Excellent shot. Fantastic capture Steven !! The detail here is superb !! Despite only living iabout 325 miles from Key West, I have never visited the area. Thank you for sharing.